A rain event has been picked up by the models for Monday. 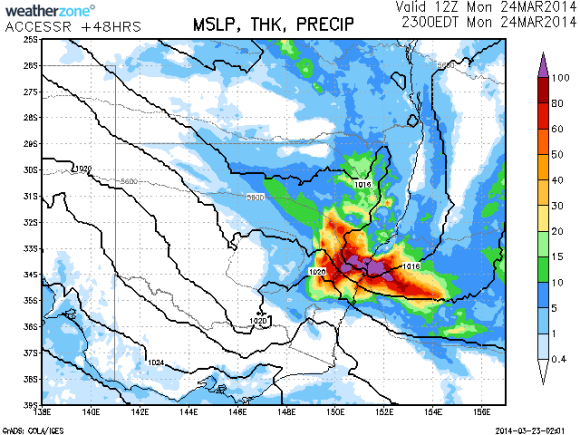 This rainfall event if it does eventuate will be quite substantial with rainfall totals of the order of 100mm or more in Sydney and the surrounding districts. 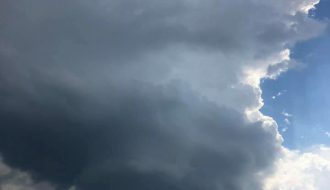 With a combination of a low pressure system, a cold pool upper trough approaching aloft and surface moisture, this could be concentrated on this Sydney region. This event needs to be monitored closely! 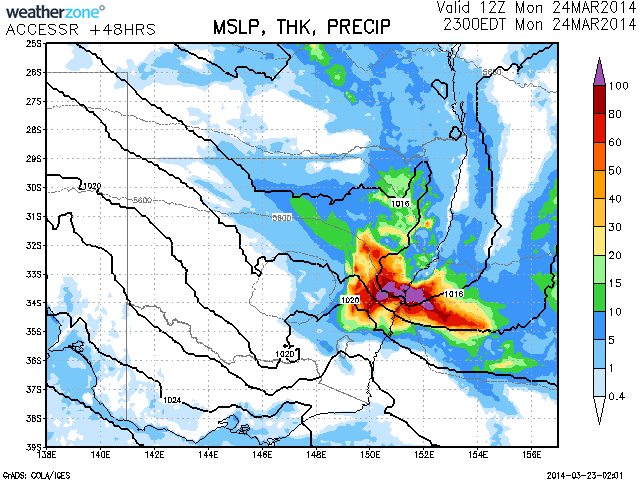 Latest model guidance has heavy rainfall positioned just south of Sydney in the Wollongong area. I was thinking the same thing after checking the upper level charts just b4 on the bom site. Maybe tomorrow and/or Tuesday might c very heavy rainfall in Sydney. Some heav falls and a warning at 2pm issued for the coastal districts near Cronulla for very heavy rainfall. You could see on radar rain coming inland fromnthe ESE ahead if a sharp band if rain and storms from the north. Current radar shows a little low that has developed and stalled the rain near Port Hacking! Posted a radar on the report of this low spiral. 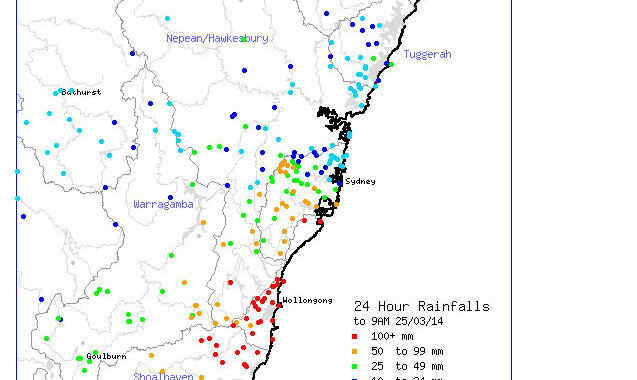 Please find attached the rainfall plot for Sydney for this event. Some of the falls are impressive. In particular the events have been concentrated around Blacktown and Southern Sydney. From this single event Cronulla had 105 mm and there is a fall of 110 mm around Sutherland. Following that, some impressive figures around Blacktown ranging from 57 mm to 82 mm. That 82 mm would be around Prospect Reservoir and around 65 mm where I live. Interestingly only 27 mm around Kings Langley a few km to the north. La Peruse had 70 mm while only 1.5 mm at Mona Vale. Falls are not even. I have heard on the news a number of roads being closed such as Aulderly Weir Road and it appears that a person has been swept into a drain but limited details available. 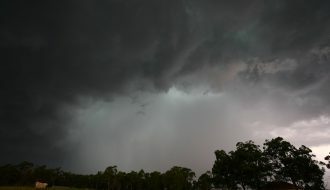 At Auburn where I work, a period of heavy rain ensured between 12.30 pm to 1.30 pm and some thunder was audible before easing. On the way home, I passed the Woolworths at Prospect and noted the car park was flooded and there is evidence that water levels had risen in some of the low lying areas during the event. 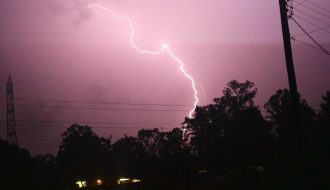 Harley can you post another for the 24 hour totals including the Illawarra totals please. At sunrise this morning, a bank of Cumulonimbus clouds were evident just off the coast and south of Sydney that slowly moved towards the south. 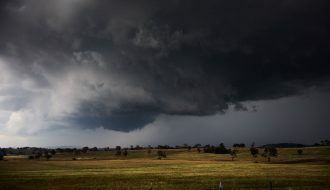 Overnight, some impressive to even incredible rainfall occurred that was highly concentrated within the Illawarra, Wollongong and the northern parts of the South Coast. The heaviest fall was at Station Number 568076 being Brogers No 2 – Brogers Creek where 309 mm of rain fell. 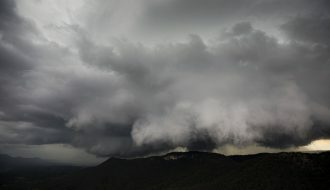 All of Wollongong received well in excess of 100 mm but the escarpment and hills behind Wollongong and Shellharbour had even more concentrated rainfall. For example, Mt Pleasant had 209 mm and Beaumont (The Cedars) had 210 mm. 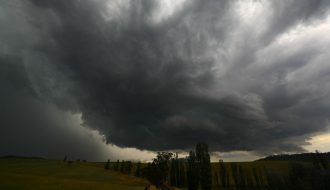 This was followed by 192 mm at Broughton Creek and 190 mm at Barrengarry. Again, it is likely that orographic influences and topography were at play concentrating rainfall into very localised areas. Beyond the escarpment, Avon Fire Tower had 125 mm but falls taper away further west. 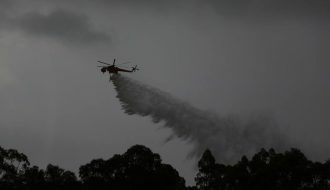 Fitzroy falls managed 142 mm, Belambi had 113 mm and even Nowra Airport had 158 mm. Please find attached the BOM rainfall plot for the 24 hours till 9 am 25/3/2014. The red dots shown are concentrated within the Illawarra district. When viewing the orange dots, it is identified that big totals of 70 mm plus falls occurred north of Ulludulla on the South Coast and even reasonable totals extended all the way to Goulburn with 30 and 40 mm common. Sydney shows up but this is covered within an earlier post. However it is noted that a final total of 132 mm occurred at Cronulla. Hence another 22 mm fell there overnight. There is also a final total of 112 mm at Sutherland. 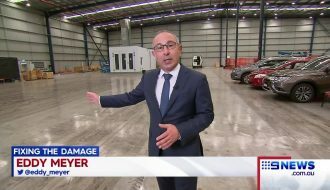 Referring back to my post of yesterday covering Sydney’s storms, it appears that SES personnell were called out to some 630 storm related jobs for flooding, sandbanking and damage matters.